Protesters holding posters of Khalida Jarrar and Ahed Tamimi to show solidarity with Palestinian prisoners held in Israeli jails on 1 January in Gaza City. The Israeli military filed 12 charges on Monday against Palestinian teenager Ahed Tamimi. The 16-year-old, who was filmed in an encounter with soldiers in her home village of Nabi Saleh last month, could remain in Israeli prisons for years if convicted on charges including throwing stones, incitement and assaulting and threatening a soldier. Israel’s military tribunals are notorious for their near-100 percent conviction rate against Palestinians. In an interview with The Real News last week, Ahed’s father Bassem Tamimi described his daughter’s 19 December arrest in a night raid on the family’s occupied West Bank home. 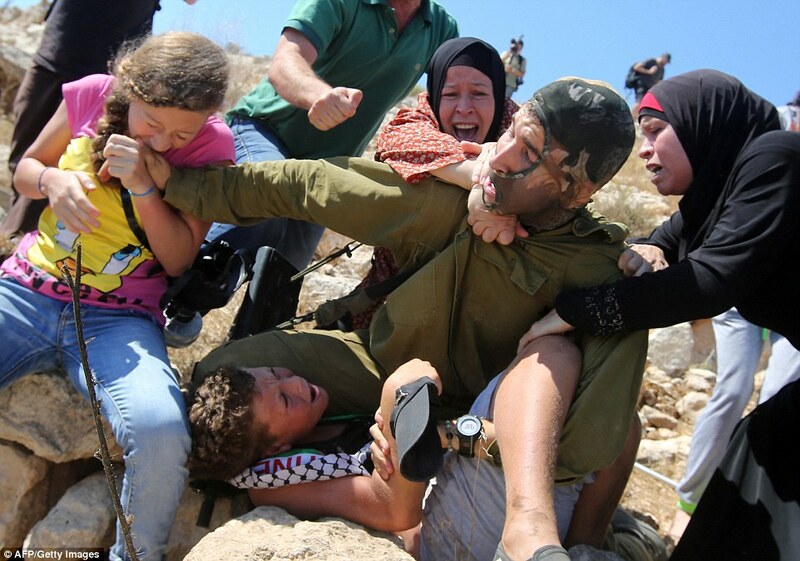 He also repeated his contention that one of the soldiers Ahed is accused of “assaulting” had earlier shot in the face and severely injured Ahed’s 15-year-old cousin Muhammad Fadel Tamimi. Ahed and her cousin Nour attempted to remove two Israeli soldiers from the family’s property. Ahed was seen in a video lightly slapping and shoving one of the armed men. Ahed, Nour and Ahed’s mother Nariman, were all detained by the army following the circulation of the video amid calls by Israeli leaders for revenge against the family. Ahed is one of more than 300 Palestinian children currently in Israeli military custody. Nariman is also facing charges of “incitement” for live-streaming the incident. Nour, 20, was due to be released on Monday, but was also charged on Sunday with aggravated assault and interfering with a soldier’s duties. According to her father Naji Tamimi, she remained in custody following an appeal against her release by the Israeli military prosecutor. In a post on Facebook Tuesday, Naji Tamimi said he expects another hearing in her case in coming days. The Tamimi family has become well-known for its role in Nabi Saleh’s civil resistance against Israeli occupation and colonization, a campaign that has cost many villagers their lives and freedom due to Israel’s violent response. According to family member Bilal Tamimi she was set to be released Tuesday if Israeli military prosecutors did not object. Ahed has become an international focus of solidarity, and for many an icon of resistance, since Israeli occupation forces seized her from her home. From a young age, Ahed has participated in defending her village and home from Israeli soldiers. Yet the solidarity has been selective. “There has been a curious lack of support for Ahed from Western feminist groups, human rights advocates and state officials who otherwise present themselves as the purveyors of human rights and champions of girls’ empowerment,” gender researcher Shenila Khoja-Moolji observes in a commentary for Al Jazeera. Caspit’s comment was widely interpreted as a suggestion that the women should be sexually assaulted, though he adamantly denied this. Ahed, like the Nobel Prize-winning education campaigner Malala Yousafzai, has a long history of standing up to injustice, Khoja-Moolji notes, but unlike Malala, Ahed has yet to receive invitations to meet world leaders including Barack Obama or to address the United Nations. On the contrary, last year Ahed was blocked from traveling to the US to speak about the injustices faced by Palestinians. Her father Bassem, previously declared by Amnesty International to be a prisoner of conscience, was also denied a visa to speak in Australia. The detentions of the Tamimis came amid a wave of almost 600 arrests of Palestinians by Israeli occupation forces since US President Donald Trump recognized Jerusalem as Israel’s capital on 6 December. More than 450 Palestinians are currently held without charge or trial – so-called administrative detention which can be renewed indefinitely. Last week, Israeli military courts confirmed or renewed administrative detention orders against 41 Palestinian detainees. Among those whose orders were renewed is promiment leftist leader and Palestinian Legislative Council member Khalida Jarrar, who was most recently arrested in July. Israeli occupation forces detained Nasser Abdel-Jawad, another Palestinian lawmaker, in a pre-dawn raid on his home in the West Bank village of Deir Ballut on Monday, according to prisoners solidarity group Samidoun. His arrest brought to 12 the number of Palestinian lawmakers jailed by Israel, nine of them without charge or trial. Palestinians continue to resist their detention by Israel. Rizk Rajoub, 61, began an open hunger strike on 23 December when the Israeli military court made him choose between administrative detention and exile in Sudan, according to Samidoun. Rajoub has spent approximately 20 years in Israeli prisons, 10 of them in administrative detention. His most recent arrest from his home village of Dura was in November. Samidoun also reported on Palestinian Israa Jaabis, 32, who was sentenced to 11 years on 7 November by an Israeli court in Jerusalem. Jaabis, from occupied East Jerusalem, sustained severe burns and lost most of her fingers after a gas canister caused a fire in her car in October 2015. She was then accused of attempting to detonate the car when she was hundreds of meters from an Israeli checkpoint. Her family vehemently denied the claim, stating that Jaabis was moving to a new apartment and had been transferring furniture for days, including the gas canister when it exploded. Twitter users have been using the hashtag #FreeIsraa to show support for Jaabis, who according to Samidoun is not receiving adequate medical treatment in prison. She spent a year in prison accused of possessing a knife and intending to use it against occupation soldiers. Following her release, Marah told local media about the harsh conditions imposed on women and girls in Israeli prisons and urged support for them. I am a big fan. Especially like her "taking a bite out of Zionism" moment of a few years ago. Thought of making it into a poster. The Zionazis all call her "'Shirley Temper." I think that is just adorable. She is Shirley Temple with an anti-racist/anti-zionist edge. Is there another Nelson Mandela in the making? Where is Ahed on Wikipedia? Inasmuch as millions of people consult Wikipedia, thought I'd read their entry on Ahed Tamimi. I wasn't able to find the page in question. I'd thought that given her international profile and current travails, there would be a sizable profile of this girl. I located a Wikipedia page for her father Bassem, but nothing for the child. Am I alone in finding this odd? Yesterday Glenn Greenwald appeared on Democracy Now to discuss Facebook's removal of Palestinian posts at the express demand of Israeli authorities. I hope the same process of suppression isn't underway at Wikipedia. Perhaps there's an innocent explanation. If so, I'd like to hear it, because deleting a figure so prominent in the struggle for Palestinian rights would raise serious questions. Can one of your reporters at the Electronic Intifada approach Wikipedia with a formal query? There may be nothing to this. Then again, it could be significant. Update to my previous post regarding Wikipedia: just went to Wikipedia site rather than conducting a normal online search through Google (maybe that was the problem) and managed to locate their article on Ahed Tamimi (given as Ahd Tamimi). There didn't seem to be anything unusual in the entry- if anything it was less contentious than the one on Bassem al-Tamimi, Ahed's father. But there was a curious notice at the top of the page- "This article is being considered for deletion in accordance with Wikipedia's deletion policy." I then looked up their deletion policy, which contained a list of possible reasons, none of which seemed to apply in this case. In any event, the article was not circulating widely and may be scheduled for removal. Wikipedia has now- as of Jan 4- posted its biography of Ahed. It's classified under "extended confirmed protection" which means the entry is not subject to random editing by any and all readers. Considering the vitriol directed at her by Zionists, that's probably merited. Wikipedia does struggle with bias sometimes, but if the collective efforts keep Tamimi info open and honest, then kudos to Wikipedia! A friend of mine who worked for AIPAC in college (unwittingly) about 15 years ago told me that AIPAC's hasbara machine spent a HUGE amount of money and effort just to keep running in place. I'll bet it's a lot more work for them now! We have to keep working on this to free Palestine. Thanks much to Electronic Intifada. Consider the resulting sentence given Elor Azaria for murder, to what Israeli justice (sic) awaits Ahed Tamimi. Consider the destruction of homes of Palestinian relatives, to the home of Elor Azaria or his relatives. Even more, consider comparing that his home is protected by the most militarized populace in the world, to the homes of the most militarily oppressed people in the world. Even more, consider what that militarized populace is subject to by that military and the protection given Israeli citizen Jews and their criminal actions. And yet, Israel wants to trot out to the world such lies as, "The most moral army in the world," or how just it is in its sentence to Elor Azaria as proof of "the purity of its army and codes". If the Zionists believe these lies, the world doesn't. My blog is now nearly 10 years old and there have been over 2,000 posts on it. I support Ahed Tamimi with all my heart and all my ability. She is an example of great courage. On the other hand, the brave IDF soldiers who kill, maim, brutalize, bully, and humiliate women and children on a daily basis should be called what they are: bullys, cowards, murderers, and thieves. Those IDF soldiers who shoot unarmed protesters in the face with tear gas canisters or actual live ammunition should come to my part of the U.S. I am a bit past my prime, but I was trained as a Marine, and I would gladly go one on one with one of the brave, heroic IDF soldiers who put children in choke holds and who steal land from occupied people. Bring it on, brave IDF soldiers.